In May this year it will be 150 years since the birth of Frank Hornby, the inventor of Hornby Trains and Meccano. To celebrate, there will be a weekend extravaganza in Maghull (near Liverpool) where he used to live, and I'm delighted to have been asked to paint a couple of pictures for the exhibition. When I get an idea in my head I have to get cracking with it before I burst with anticipation. I don't own any Hornby trains and couldn't find any Hornby photographs that I could use without infringing copyright, so I decided to begin with this: a locomotive on the West Coast Wilderness Railway in Tasmania. I found the reference photo for this painting on a wonderful website called Paint My Photo - where photographers and artists meet. This is a superb resource full of copyright-free photographs for artists to use as they wish. 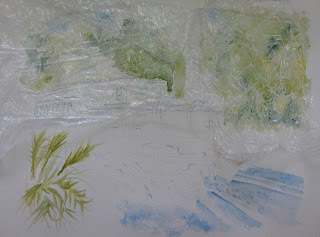 In this blog post I'll show you the stages of producing my first painting for the exhibition. I began by lightly sketching the outline of the train and track, and masked out the highlights on the train and the track. Next I added an initial light wash of green for the trees and blue for the sky. Whilst the trees were still wet I randomly sprinkled a little table salt and then pressed some cling film on top to give texture. Next I added blues for the gravel and then sprinkled with salt. Then I began to add colour for the train and carriage, lifting colour with a tissue to get a steamy effect around the bottom of the train. When the paint under the cling film was dry, I removed both it and the salt and then repeated the process to strengthen areas of the trees and a bush in the foreground. 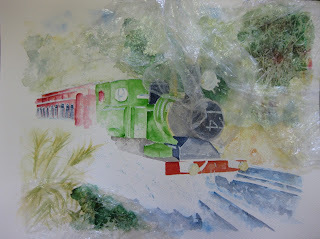 Whilst this was drying I began to more clearly define the train. I continued to add colour and depth. It's very important to maintain a contrast between light and dark - this is what gives a painting that 3D effect. 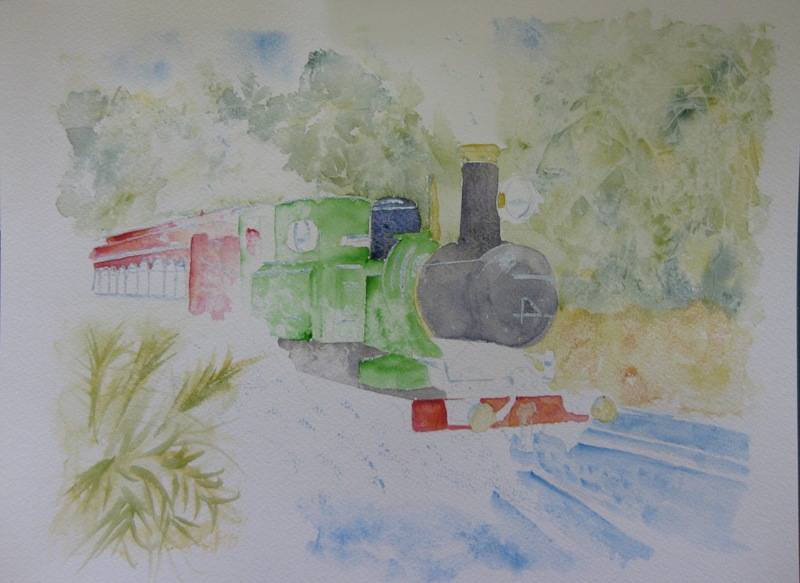 At this stage I also began to add blues and purples to define the steam, remembering to leave a lot of white too! I used blue and purple instead of grey for interest. Next I added definition to the areas that had been masked out, and added a touch of definition around the background - splashes of blues and greys in the gravel, grasses to the right hand side, and further definition in the steam using some negative painting and some dry brush strokes. OK, I'm happy with the painting, now for the mount. I looked at various shades of blue, cream and white, and decided on a pale blue and a cream. Blue helps the train to really stand out, but blue alone is too dominant. So I added a cream, just leaving some blue to show through. And finally, I chose a large natural wooden frame in light oak. Finished.....or was it? Darling Husband spotted an error late last night - the lamp was not connected to the train! Here it is with the connecting piece added in. The only thing left to decide is how much to charge for it...and to start work on my next piece! Nice painting and it looks great in your choice of mount and frame. Wonderful painting and so interesting to see the various stages in it's development. Love the choice of mount and frame too. 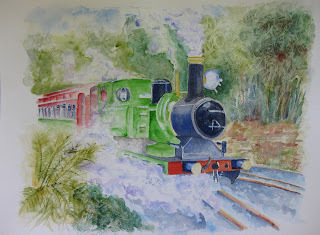 Fabulous painting Stephie, my son used to be mad on trains and has a collection of Hornby trains put away for safekeeping. Thanks for your kind comments guys - I'm glad you like it and enjoyed reading about its development. Brilliant I featured this on PaintmyPhoto earlier this week - love it, great to see the stages! Sharon, thanks so much for featuring it on PMP - I was absolutely thrilled to see my art there on the top row! FYI, just in case they ask you to paint anything that needs to include dates, 2013 is the 150th anniversary (from 1863). Ooops, my mistake! Thanks for the pointer, I'll pop back into my post to correct it.